Asteroids was a runaway smash hit for Atari in the arcades, so there was no way that it wasn’t going to find its way onto the VCS. The premise of the game is that your small spacecraft is stuck in the middle of an asteroid field. Every time you shoot an asteroid it breaks up into a smaller asteroid, until it is finally destroyed completely. At the same time, UFOs and satellites cruise by while shooting at your ship, and can be destroyed for bonus points. Once you clear the screen of asteroids, a new group pops up and you start it all over again. You can rotate your ship and use forward thrust, but there are no brakes so if you want to stop or reverse your course you have to turn around and apply thrust in the opposite direction. You also have a “hyperspace” option which you activate by pushing down on the joystick. Doing so will cause your ship to disappear and randomly reappear elsewhere in the asteroid field. Used as a last resort it can save your ship from imminent danger, but can also put you right in the path of an asteroid with nowhere to go. Other game modes assign different functions to the down direction, including shields or the ability to flip around 180 degrees, but hyperspace is the default option and a carryover from the arcade game. The home version of the game looks quite a bit different than the original, due to the arcade game’s use of vector instead of raster graphics. 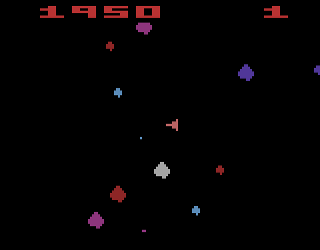 Unfortunately this makes the asteroids themselves look more pixelated, but on the plus side the game is in color instead of black and white. The most noticeable difference in the game play is in the movement of the asteroids themselves. While in the arcade they came from all directions, in the VCS version all of the asteroids start out scrolling vertically across the left and right edges of the screen. This makes it a lot easier to just park your ship in the starting position and blast away, with little movement needed to avoid danger. Less challenging than the original, Asteroids for the VCS is still an acceptable port of the arcade classic, but it has been far surpassed by subsequent ports and clones including Asteroids for the Atari 7800 and Mine Storm for the Vectrex. Buy Asteroids on GameGavel or Amazon. Tagged 2600, Arcade, Asteroids, Atari, Review, Shooter, VCS. Bookmark the permalink.